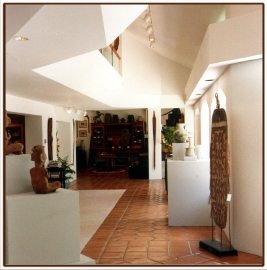 GALLERY AT WAIOHAI. 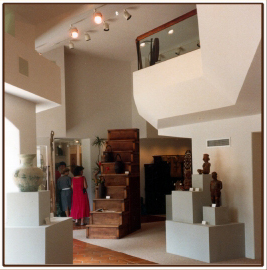 This gallery of arts and crafts from artists of Hawaii is designed to be harmonious as well as flexible in display possibilities. The use of a molding detail of traditional "dentel", consisting of a continuous module of evenly spaced cubes of koa, provides for the support of glass shelves in an infinite variety of spacing. This unconventional solution to the need for display flexibility is an example of the use of a decorative detail to mask the necessity for the shelf standards typically seen. 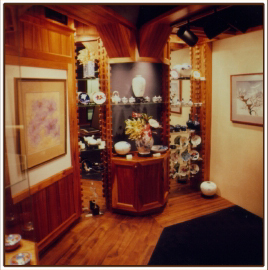 The carpet and wall covering are one color of deep blue, which counter points the use of koa in all trim, molding, and display pedestals. The simple use of only two materials throughout helps to focus attention on the art work -with the walls, floor, and ceiling blending into a cohesive backdrop. 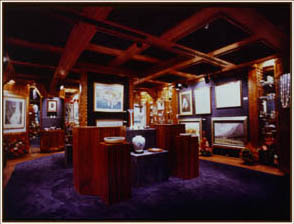 HEMMETER GALLERY. 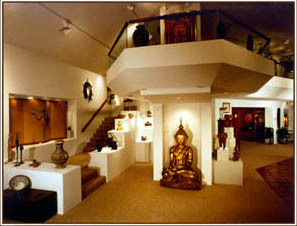 This gallery of antiques and objet dart from various cultures is in a space only intended for ground floor display. By evaluating the cross section of the existing space it was determined that, in fact, enough head-room existed to allow for a limited second floor. 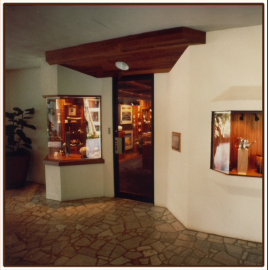 This both increased the square footage of display space and provided various stages of display and viewing. This is an example of not accepting the limitations of a space at face value, and pursuing alternate solutions to maximize the potential of a given space.